May 24, 2009- Crash with entrapment in Wayne Twp. May 24, 2009- At 23:15 station 1 was dispatched for Rescue 727 to assist District 34 (Friedensburg and Summit Station) on a motor vehicle accident with entrapment at 744 Route 183 South. The rescue was off the floor quickly and luckily were not utilized at the scene as the patient had been extricated. They were out of the boro for about 45 minutes. May 22, 2009- Just as Chief 723, Engine 732 and Rescue 727 were returning from the previous vehicle fire, the alarms struck again, this time sending them to the area of the KNBT bank on Route 61 for a vehicle accident with injuries. Units were on scene quickly and did patient care and packaging until the ALS truck arrived. Units were on scene for about a half hour. May 22, 2009- At 17:12 stations 1 & 2 along with District 41 (Cressona) were dispatched to the Cressona Mall, in the area of Blockbuster for a reported vehicle fire. Chief 41 (Mansell) was first to arrive on scene and had all incoming units reduce their rate, do to the fire being knocked down. Engine 732 and Rescue 727 went responding on the call, and were cleared within 15 minutes. May 22, 2009- At 15:13 all 3 Haven stations were dispatched to the intersection of Avenue D and East Main Street for a motor vehicle accident with no injuries, but with a small amount of fluids down. However, no apparatus even got off the floor before being cancelled off by Sch. Haven Police, stating that there was no need for any apparatus. 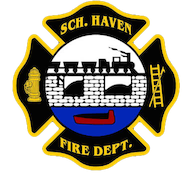 May 19, 2009- At 18:43 the Schuylkill Haven Fire Department was dispatched to the area of “The Island” to assist the Schuylkill Haven Police Department on a search. Station 2 covered the lower walking path, Station 4 covered the upper walking path, and Station 1 covered the area of Dock Street. Units were on scene for about a half hour, and luckily the lost individual was located and all units were cleared. May 17, 2009- At 15:42 the Schuylkill Haven Dive Team was dispatched to Stoyer’s Dam to assist the awaiting Schuylkill Haven Police Department on a special assignment. The dive team was on scene for about 20 minutes for removal of a fallen water fowl……..
May 16, 2009- At 09:50 stations 2 & 4 were dispatched to 143 South Tulpehocken Street, Pine Grove Boro, for smoke in a commercial building. Engines 732 and 737 went responding, but before reaching the scene of the fire, they were asked to divert to Pine Grove HH&L station to cover Pine Grove, until their units were released and put back in service. All Schuylkill Haven units were out of the boro for just over 1 hour.